Controversy surrounding the current ruleset for the MLG CoD League as well as online tournaments is at an all time high as players have expressed their discontent over certain aspects of the game. Most people in the community, both players and spectators, are starting to agree on what needs to be changed in order to make Advanced Warfare the best it can be. However, nothing is currently being done about it from MLG or the producers. Many feel that certain Exo-suit abilities, perks, and weapon attachments are not competitively viable to play with or enjoyable to watch. Overall, the universal MLG Variant 2.0 Game Settings are solidified and agreeable within the competitive Call of Duty community. The only arguable setting that could possibly be removed or changed for a future ruleset would be the Dynamic Events within maps. Dynamic Events. This is a selectable option within the General Settings in a Private Match Lobby. It deals with certain map elements that change throughout the game. For example, the map Bio Lab, used in all CoD eSports’ game modes and types, has a suspended conveyer belt of toxic gas containers, which move throughout one side of the map. These containers can be shot, exploding a green colored gas, used either to kill or hurt an opponent depending on proximity. There have been multiple complaints from players and spectators wanting certain items to be restricted to make the gameplay more competitive and more enjoyable. Many believe that banning the listed items below will widen the skill gap and make it more interesting from a spectator’s perspective. Ban cloak/stim/rapid fire/threat grenades/nerf hover so you can’t contest hills/remove ctf. Bulldog. Similar to Infinity Ward’s Call of Duty: Ghosts title, this weapon is a semi-automatic shotgun, having the highest damage in its class. Similar to the Ghosts argument, this shotgun is too overpowered and versatile at close range. In many Search and Destroy maps with close quarters, this weapon becomes unbeatable with it’s damage at certain points. Danger Close. This perk increases explosive and scorestreak damage. It is very similar to Ghosts’ blast radius and 40% damage increase. Danger Close was banned later within the Call of Duty: Ghosts’ season after being deemed overpowered. It seems to be the case again in Advanced Warfare, being a very important asset in Search and Destroy. If players choose to run two semtex or frag grenades along with Danger Close, they’ll be able to clear bomb sites and players with ease. Rapid Fire. This attachment increases a weapon’s fire rate with a slight accuracy and recoil penalty. Sledgehammer Games’ first major patch on Advanced Warfare increased the max damage range on a submachine gun known as the ASM1. With this buff, the ASM1 is arguably on par with the Bal-27 assault rifle. The Bal was arguably the best weapon overall until it was patched, having its damage reduced, max damage range decreased, and recoil adjusted. Rapid Fire allows the ASM1 to have an increased firing rate killing opponents extremely fast, making it unfair to competitors using a ASM1 without Rapid Fire or a Bal. Stim. This ability allows a player for a limited period of time to generate health above normal levels once enabled. For those who aren’t familiar with Stim, it’s somewhat comparable to the Juggernaut perk used in past Call of Duty titles decreasing bullet damage dealt upon you. Players don’t really enjoy shooting more than the normal amount of bullets it takes to kill someone. It makes it less enjoyable for spectator to see their favorite player get killed in gunfights that he should have won. Cloak. This ability allows a player to go temporarily invisible until a player shoots, Exo-launches, or the Exo Ability battery runs out. One can make out the distorted outline of a cloaked player, yet it still is difficult to notice at varied distances. This becomes very frustrating in game, especially in the gamemode Hardpoint, when the opposing players can break into a hill without being seen as easily. It’s also seen as a problem in Search and Destroy, where each player has one life per round. Every kill is vital and having the ability to temporarily become invisible and perhaps get a kill by flanking or keeping one’s distance is not viable. Hover. This ability allows a player to hover in mid-air for a short period of time, allowing one to still shoot their weapon and use their Exo-launcher. The issue that develops from this Exo Ability is that within the gamemode Hardpoint, a player can still contest the hill while being airborne. Obviously killing people in mid-air is bit challenging for some, but being able to contest a hill while not actually touching the hill and having the ability to shoot and exo-launch leaves others at a disadvantage. Stun Grenades. Stuns have the ability or blinding, disorientating, and slowing enemies once detonated automatically or manually. Stuns have been an iconic tactical grenade throughout all Call of Duty titles and won’t be seen getting banned most likely anytime soon. A nerf or reduction to its flash and disorientating punch would be preferable to the competitive community. Threat Grenades. A threat detection grenade that when automatically or manually exploded reveals enemy locations through walls highlighted in red and will temporarily stun them. This is basically UAV in a grenade canister. It allows a player to reveal the locations of players before they even get into a gunfight, allowing one to strategize his or her approach. This mainly is an issue in Search and Destroy where players can clear out the vicinity of a bomb site safely. Capture the Flag. The objective of this gamemode is to capture an opposing team’s flag and return it to the player’s team flag base. A point will be added only if one’s team flag remains at its base, otherwise it will remain contested until a player’s team flag is returned. It may seem odd to remove one of the most iconic game modes within the Call of Duty eSports’ scene, yet it seems a lot of the community want CTF removed from the competitive rotation, at least for Advanced Warfare. With Uplink seemingly becoming a fan favorite for its fast paced, entertaining, and heart-pounding gameplay, many want CTF removed to allow the standard three game mode rotation of Hardpoint, Search and Destroy, and Uplink. CTF doesn’t seem to mesh well with the pace of this game. Surprisingly, ever since MLG Columbus finished many have changed their opinions on removing Uplink from the standard rotation. Obviously nothing will change heading into UMG Orlando and the remainder of the MLG Pro League Season 1 unless the community could perhaps persuade MLG to change their ruleset, and have Sledgehammer Games nerf certain items. 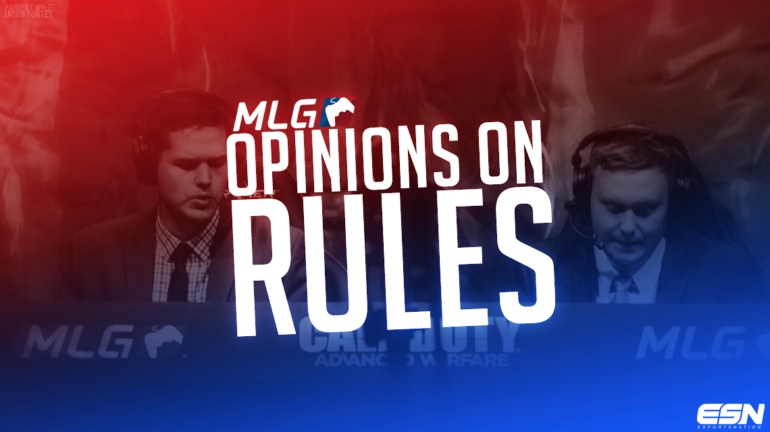 This concludes the community’s opinions on the current conflicts with the MLG Variant Ruleset. Let us know how you feel with the issues listed prior.